One year your company has $45 million in funding, and the next you’ve been delisted from the NASDAQ. It’s just another day in the life of a founder. And it’s exactly what happened to entrepreneur Eric J. Kuhn. Kuhn started Varsity Books, an online marketplace for college textbooks in 1999. After receiving a massive amount of funding and going public, the stock market crashed and his company went from 250 employees to 14. But in 2000, Kuhn decided to pivot and Varsity Books became an online bookstore for private high schools. The company found huge success in this model and to Kuhn’s knowledge, Varsity Books is the only company to have ever been relisted on the NASDAQ. Eventually, in 2006, Kuhn sold his shares and left the company. During his ups and downs as a founder he thought, “Why isn’t there a dedicated community for entrepreneurs?” Kuhn recognized that entrepreneurs need to travel well and want to receive similar treatment as the CEO of Goldman Sachs, but their bootstrapping ways combined with a lack of a corporate discount necessitate they do so on a budget. In 2009, Kuhn started cooking up the idea for FoundersCard, an organization he now successfully runs with over 5,000 members. He describes the FoundersCard as a community of entrepreneurs and innovators with the opportunity to see and experience great things. Essentially, it’s a loyalty program for entrepreneurs with stellar networking events. Benefits include exclusive discounts from hundreds of businesses including Apple, Rackspace, Moo, FedEx, GigaOM Pro, Equinox gyms, spas, online shopping sites like Gilt City, hip hotels like The Standard, airlines like Virgin Atlantic and American Airlines, telecom companies like AT&T, and other great services like Zipcar, Uber, LimoRes and Roomorama. All agreements adhere to the same principal: the discounts are either exclusive to FoundersCard members or are valued at rates no one else receives. FoundersCard hosts several networking events throughout the year in New York City, San Francisco and Miami, with Boston and Los Angeles coming soon. Members say they are an incredible opportunity to mingle with other members and cultivate a tight knit, mutually benefitting community. As more startup founders join, those founders give other members discounts to their services. For example, Ryan Graves, the GM & VP of Business Operations at Uber, an on-demand car service app, has been a member since 2010. Other FoundersCard members receive 50% off their first ride and 15% off rides thereafter. “They’ve assembled insider rates at great hotels like the Park Hyatt Tokyo. The card pays for itself with one night’s stay,” says Media Strategist Colin James Nagy. 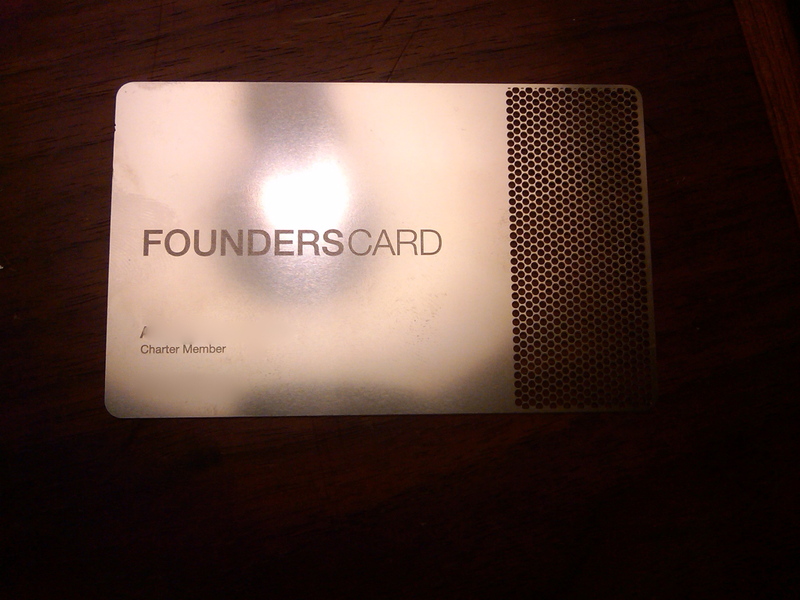 The FoundersCard accepted its first application in December 2009. Membership is by invite and referral only; because of this, they tend to have a very high acceptance rate. The application is a simple process and takes no longer than 15 minutes to fill out. Membership rates are $495 per year plus a $65 initiation fee; however, I have yet to find a member who pays the full price. Most members receive a discounted invite from other members for $200 per year. Members are given FC points to refer other members to join that lead to even better deals with partners, and perhaps even a different color card. Kuhn, who says this type of organization has never been done before, self-funded Founders Card, which saw cash flow after just three months and is currently profitable. While they have members all over the globe, only 15% of their base is international, and over half of those members are based in the U.K. The majority of FoundersCard members are located in New York City. NYC is exploding. We are at the epicenter. And as all of these companies form, FoundersCard sits at the intersection of them all…And for the first time in my lifetime NYC is totally accessible to the entrepreneur. Whether you like perks, learning about new services or meeting new people in your tech community, FoundersCard has given entrepreneurs one more reason to leave the corporate life and go out on their own.